PASADENA, Calif. (NASA PR) — Engineers at NASA’s Jet Propulsion Laboratory in Pasadena, California, have begun transmitting a new set of commands to the Opportunity rover in an attempt to compel the 15-year-old Martian explorer to contact Earth. The new commands, which will be beamed to the rover during the next several weeks, address low-likelihood events that could have occurred aboard Opportunity, preventing it from transmitting. The rover’s last communication with Earth was received June 10, 2018, as a planet-wide dust storm blanketed the solar-powered rover’s location on Mars. “We have and will continue to use multiple techniques in our attempts to contact the rover,” said John Callas, project manager for Opportunity at JPL. “These new command strategies are in addition to the ‘sweep and beep’ commands we have been transmitting up to the rover since September.” With “sweep and beep,” instead of just listening for Opportunity, the project sends commands to the rover to respond back with a beep. The new transmission strategies are expected to go on for several weeks. They address three possible scenarios: that the rover’s primary X-band radio — which Opportunity uses to communicate with Earth — has failed; that both its primary and secondary X-band radios have failed; or that the rover’s internal clock, which provides a timeframe for its computer brain, is offset. A series of unlikely events would need to have transpired for any one of these faults to occur. The potential remedies being beamed up to address these unlikely events include a command for the rover to switch to its backup X-band radio and commands directed to reset the clock and respond via UHF. Time is of the essence for the Opportunity team. The “dust-clearing season” — the time of year on Mars when increased winds could clear the rover’s solar panels of dust that might be preventing it from charging its batteries — is drawing to a close. Meanwhile, Mars is heading into southern winter, which brings with it extremely low temperatures that are likely to cause irreparable harm to an unpowered rover’s batteries, internal wiring and/or computer systems. If either these additional transmission strategies or “sweep and beep” generates a response from the rover, engineers could attempt a recovery. 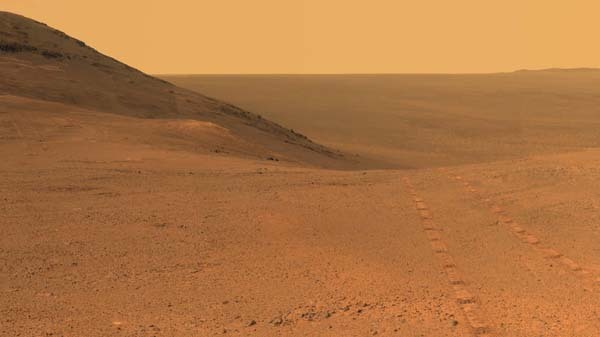 If Opportunity does not respond, the project team would again consult with the Mars Program Office at JPL and NASA Headquarters to determine the path forward. Best of luck to the JPL team for the successful recovery of Opportunity. It’s been the “not so little rover that could” and it would be great to have it performing science again.